Pulling a late one here, I try not to work on this on weekends but as I am now facing a back log of posts which are fast piling up, I thought I'd get this treat out before resuming the regular schedule tomorrow. Now as stressed in the previous black metal post on Ohtar, I adore the suicidal, depressive black metal that took root through Burzum's first 4 records, now whilst also having a great affection for the more merciless, ripping black metal out there, the artists that create this noise is what really affects me, what really connects with me. Now Wigrid's debut album reared its ugly head back around 2002/2003 on the awesome http://www.no-colours-records.de/, my gut tells me it came out in 2002, but it took me a long time to get my hands on a copy. It was worth the wait, like its kindred spirits coming out at the time, i.e. 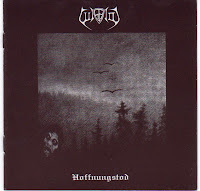 Xasthur, Leviathan et al, Hoffnungstod was bleak, dirgey and horribly misanthropic. The German lyrics and tongue add to the morbid feeling of the record I can only speculate what Ulfhednir was wretchedly cursing but as German is one of the heavier (if not the heaviest) European language, I can imagine that his lyrics were filled, in fact, crammed with utterly hateful annunciations of mankind. I find this record a good accompaniment for reading, not as background music but to enhance my concentration and immersion within the material, (its helping me overcome the novels of Proust, a truly toiling (but worthy) effort that require you integrate yourself into Proust's world so that you can comprehend it but also so you don't switch off from it because it is detailed). Now this record is readily available from the label, and http://www.aquariusrecords.org/ is still listing it here, http://www.aquariusrecords.org/bin/search.cgi.